Limoges porcelain. 10.6" x 9". Handmade in France. Hand wash only. During his short, seven-year career as an artist, Gerald Murphy produced only about fourteen paintings. 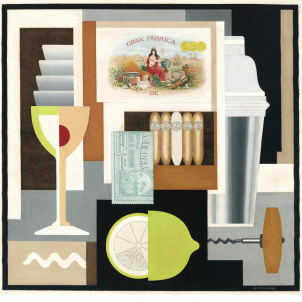 Key among them is Cocktail, a bold, stylized still life comprised of flattened geometric shapes, overlapping forms, and spatially illogical juxtapositions. A poignant memento of the urban, sophisticated lifestyle of the Jazz Age, the painting’s formal qualities are reminiscent of French Cubism as well as the industrial aesthetic of the American Precisionists. Yet Cocktail is also distinguished by its uniquely autobiographical approach. The depicted accoutrements of a typical 1920s bar tray were based on Murphy’s memory of his father’s bar accessories, and the five cigars represent the artist, his wife, and their three children. 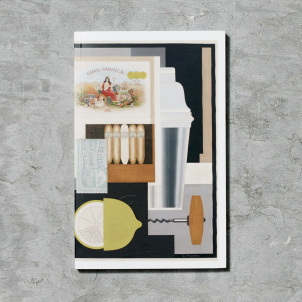 The illusionistic depiction of the box cover, which alone took four months to complete, shows a robed woman surrounded by items that allude to Murphy himself, including a boat (he was an avid sailor) and an artist’s palette. By celebrating a ritual that was forbidden during Prohibition in America, but which became a distinctive feature of European life during the 1920s, the painting also affirms Murphy’s status as a stylish and worldly expatriate.